Congratulations on choosing Spider Mini™! Spider bodies are made of two main segments: the cephalothorax and the abdomen. The cephalothorax is in the front and possesses the legs, mouth parts, and eyes. The abdomen is in the rear with the spinnerets at the very end. Three different types/patterns of fabric are best: one for the cephalothorax top, one for the abdomen top, and one for the undersides of both body parts. Download the PDF pattern, print the page out at 100%, choose the pattern set you want based on sewing method, and cut it out. Trace the hand-sew patterns and cut out the shapes. Match the corresponding pieces together so that the finished fabric side is facing inward. Sew along the outside about 3-4 mm from the edge, making sure to leave a 1 cm opening at the front of the abdomen and anywhere on the cephalothorax (it's round, so it doesn't matter). This is quicker and you can mass-produce a whole army of Spider Minis at once by laying out multiple patterns on larger pieces of fabric, but you really need a machine with some sort of quilting/free motion foot, otherwise you'll be sewing in annoying little straight line segments. Match the top and underside fabrics so the finished side is inward. Trace the machine-sew patterns onto one side. Stitch along the line, making sure to leave a 1 cm gap at the front of the abdomen and anywhere on the cephalothorax, and that you double stitch near the ends so they don't come apart. Cut out the shape, leaving a margin. The rest of the sewing will be by hand. Turn the cephalothorax and abdomen inside out. Yes, it is difficult; try using needlenose pliers or something like them to grab the inside and work from there. Stuff the cephalothorax and abdomen. You can use the scraps of fabric left over from cutting them out or whatever you have at hand. The parts should be plump. Hand sew up the opening in the abdomen, then the one in the cephalothorax. 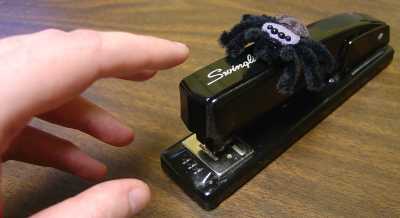 Do not cut off the excess thread from the cephalothorax; use it to sew together the two body parts. 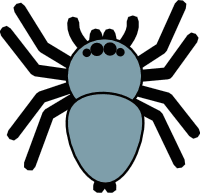 The abdomen should overlap the top of the cephalothorax by about 0.5 cm. 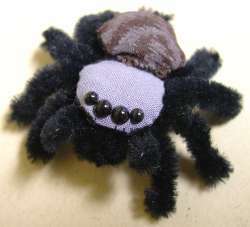 Just sew along the length of the cephalothorax/abdomen overlap on the bottom until they are firmly attached. The end result won't be pretty, but it will be hidden by the legs. NOTE: With all the pipe cleaner parts, you should crimp the ends. Use needlenose pliers to bend a couple of mm of the tips over and crimp them flat using the broad part of the pliers. This will keep fluffy stuff from coming off the ends and also keep your Spider Mini from scratching you with the sharp claws created by cutting the pipe cleaner wire. Cut one 12" pipe cleaner into quarters (a little under 8 cm each -- exactness is not important, just make them all the same). Line the four pieces up in parallel. Use thread to tie them together in the middle such that they do not bunch up, but are compressed to roughly 1 cm across. Try pressing them against a flat surface while tying them to make it easier. The point here is to make them sit flat against the bottom of the body so that all pipe cleaners are in contact with glue while squeezing them together to leave enough room for the mouth parts. Hot glue the bundle to the bottom of cephalothorax, aligned to the ugly stitching you did in the back. Shape legs to look like the picture and Diagram A. There should be three main bends on each leg: 1) bend leg up from body at base. 2) knee bend at about 1/3 of the way from base. 3) bend legs forward or backwards at base to match Diagram A. Then bend the fangs down 90° at the midpoint (red line on diagram). Hot glue the mouth parts to the front underside of the cephalothorax so the fangs are peeking out. The spinnerets produce silk. These are simple to make. Just fold a ~2 cm bit of pipe cleaner in half and hot glue it to the underside of the abdomen so that it peeks out the back a bit as in Diagram A.
Spiders have eight eyes, but we're going to just put the front four since they are the most notable, particularly on members of the jumping spider family, Salticidae, which Spider Mini most likely belongs to. The beads I used are shiny black hemispheres, available in various sizes. (If you have very tiny beads, you can try adding the other four. Otherwise, it'll look odd.) The front four are usually close together, with the two middle ones being the largest and two smaller ones on each side. Glue the eyes on as shown on picture and diagram A. You now have a Spider Mini™! 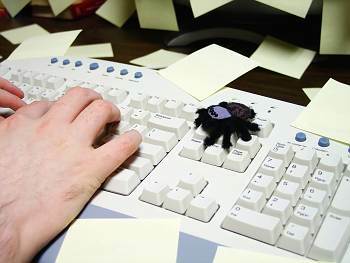 Spider Mini™ uses advanced biometrics to repel hackers from your office supplies.